Senator Elizabeth Warren soundly defeated Republican challenger Geoff Diehl on Tuesday, clearing the way for a potential, even likely, presidential bid in which she will aim to position herself as the leading liberal in what is expected to be a crowded field of Democratic candidates. In terms of drama, her reelection was a far cry from her stunning defeat of incumbent Scott Brown six years ago, but it was no less consequential for the platform it provides. Her race against Diehl, a onetime cochairman of President Trump’s Massachusetts campaign who ran as an unapologetic supporter of the president, provided Warren both a high-profile forum to show how she would take on Trump in 2020 and the space to focus on building and strengthening the groundwork for a presidential run. “Tonight, I make you this promise: We are just getting started,” Warren said after trumpeting Democrats’ success in taking control of the House in a speech to fellow party members in the Grand Ballroom at the Fairmont Copley Plaza hotel. 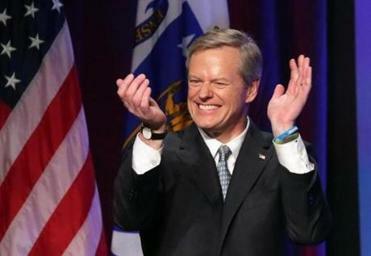 Baker, the popular Republican who has presided over a strong economy, and running mate Karyn Polito won by a 2-to-1 margin over their Democratic opponents. Warren raised an impressive amount — close to $31 million over the course of the race, according to her campaign. Much of the money came from small-dollar donors, who helped fuel the rise of Vermont Independent Bernie Sanders in the 2016 primary. Warren never ran a single television ad in Massachusetts. But she did raise or donate more than $8 million for other candidates and committees over the course of the 2018 cycle, among other efforts she undertook to support fellow Democrats across the country. Diehl’s struggle to gain traction against Warren gave her perhaps the ultimate head start in the 2020 Democratic race, enabling the Cambridge Democrat to acknowledge weeks before the midterms that, yes, she was thinking about running against Trump — a luxury she wouldn’t have had with a tougher opponent. Throughout the year, Warren visited electoral battlegrounds such as Pennsylvania, Nevada, Michigan, and Ohio, and courted key constituencies such as African-American voters. Behind the scenes, Warren built her own midterm operation focused on state- and federal-level races across the country, which could serve as a powerful network of supporters should she mount a presidential primary campaign. In the last several weeks alone she’s given to state parties in Georgia, South Carolina, Ohio, Iowa, Wisconsin, Michigan, Missouri, Florida, and Nevada, among others — in addition to the Massachusetts Democratic Party. And on Tuesday evening, Warren reiterated some of the trademark populist themes that’s she’s underscored on the campaign trail across the country: an economy rigged against workers, women, and minorities, a government “captured” by the rich and powerful. “Donald Trump still practices the dark art of ruling by fear,” she said, making one of two references to Trump in her victory speech, “fear whipped up to turn hard-working Americans against other hard-working Americans. . . . It’s gonna be hard. Nevertheless, we will persist,” she said, the crowd joining in to chant her trademark phrase. Throughout the race, Warren treated Diehl as a proxy for Trump and field tested attacks strategies she might use against the president, including in three televised debates. Cutting a mild-mannered profile himself, Diehl said he disagreed with how the president conducted himself at times, but he embraced all of Trump’s policy positions and even defended some of his more divisive statements. The state party’s conservative base enthusiastically embraced Diehl, but Tuesday’s results strongly suggest that the rest of the electorate was turned off by his association with the controversial president. About 150 people were gathered in the Whitman VFW post to support Diehl as votes were counted. Asked if it hurt him to support Trump, Diehl said no. Diehl’s loss is sure to revive debate within the Massachusetts Republican Party as to whether a more middle-of-the-road candidate might have mounted a stronger challenge against Warren. In 2012, Warren defeated Brown by nearly 8 percentage points in one of the most expensive elections in state history. Along with her fund-raising and travel schedule, there are other signs Warren has been planning a presidential run. Most prominent, perhaps, have been her efforts to finally lay to rest questions about her Native American heritage and whether she benefited professionally by listing herself as a minority. Warren released the results of a DNA test that found “strong evidence” she had a Native American ancestor dating back six to 10 generations, which kicked up criticism from Republicans as well as many Native Americans who were offended by the use of a DNA test to try to claim connection to a tribe. Victoria McGrane can be reached at victoria.mcgrane@globe.com. Follow her on Twitter @vgmac. Laura Krantz can be reached at laura.krantz@globe.com. Follow her on Twitter @laurakrantz.